Welcome along to this weeks Tuesday Tutorials, the linky where we love to read your tutorials! Tuesday Tutorials is shared across four blogs to help give you maximum exposure and each week the four hosts round up some of our favourites from the last week to share. 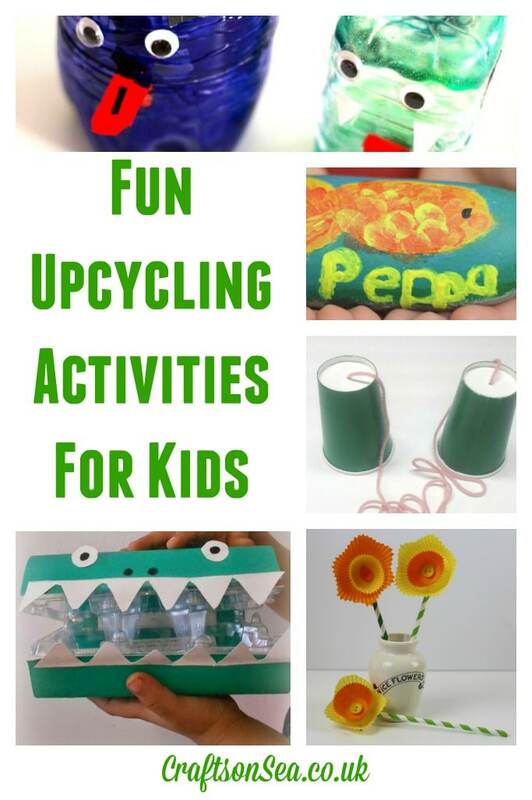 This week I’m sharing some fun upcycling activities for kids with cool things to make that you can find around your home! Cookies and Cwtches shared these fun Recycled Bottle Monsters. I love these Pebble Pets from The Boy and Me. There’s Just One Mommy shared this clasic activity to make telephones from paper cups. This Egg Box Alligator from Sand In My Toes is super cute. Mum In The Madhouse shared how to make these gorgeous daffodils from cake cases. * You can link any kind of creative tutorial, how to or recipe at any level from pre-schoolers to pro. It doesn’t have to be a new post from the last week and we don’t have a theme so use the Tuesday Tutorials Pin Party to revisit some of your best tutorial! You can link up to to three posts every week and we and we will pin some of our favourites to the Tuesday Tutorials Pinterest Board. * Please also follow the hosts on Pinterest – Gude , Eileen, The Boy and Me and me – this is not essential but would be appreciated! My fellow hosts have some great round ups too so do check out Fabric Crafts from ET Speaks From Home, DIY Spring Decorations at Hodge Podge Craft and STEM activities at The Boy and Me. Thanks for sharing our paper cup phones! We have had so much fun with them this week! That egg box alligator is so clever! I keep meaning to make N a cup phone so this has prompted me. Thanks for hosting. This is really interesting and creative way to learn children what us recycling/ reusing and why they are important to us and for the environment. I’ll suggest this activities at my little girl’s kindergarten.